2) I read about Paul A Young's awesome new chocolate flavour combination - lemon, basil and almond - and thought it sounded like the greatest thing EVER. Ok, so perhaps not miraculous in the strictest sense of the word - Saint Sara is some way off - but I knew I had to do something with these two events. Hence my lemon, basil and almond cake, a deliciously moist and zingy cake. The almonds add texture and stop the cake becoming soggy, while the basil brings out a sweetness in the lemon. Adding a traditionally savoury herb might sound odd, but it enhances the citrus flavour. I've just added basil to the syrup but you could experiment with chopping up leaves and mixing them into the batter. For the cake, I've slightly adapted this recipe. The magic of this cake is in the sticky, zesty syrup. Preheat the oven to 180C/350F/gas mark 4. Grease or line a medium-size cake tin - about 7/8 inches across. There's no raising agent so this cake doesn't need a deep tin. Cream together the butter and sugar until light and fluffy, then gradually beat in the eggs. Fold in the flour, almonds and lemon zest, then pour the mixture into your tin and bake for 30-35 minutes. It's done when it's golden-brown and a skewer inserted into it comes out clean. Leave to cool in the tin. Make the syrup by simmering the water, sugar, lemon juice and basil leaves in a small saucepan until the liquid has reduced by about half. Remove the basil leaves. Poke holes into your cake with a skewer, then pour over the hot syrup. Leave it to soak in for five minutes, then remove from the tin and cut yourself an enormous slice. This cake would fit perfectly with the citrus theme of our next Just Desserts club. If you've got a zesty pudding idea, why not join in? HOW did you keep your basil plant alive? How? I always kill the herbs. And if I didn't, Baxter would have a damn good go. I simply forgot to water this one. They thrive on neglect. Oh wow. I am totally making that this weekend. Please report back if so! I've found a recipe for candied basil leaves but I think that might be going too far. Not sure I want to eat sugary leaves with my cake. I've found that purple basil is easier to look after than the green stuff, which is great because I kill everything. And it is PURPLE! Whoa! Does it taste the same? 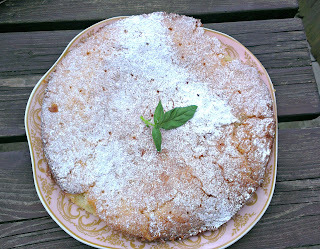 Seems like a pretty simple cake - I just need some basil now!